High Quality Content by WIKIPEDIA articles! 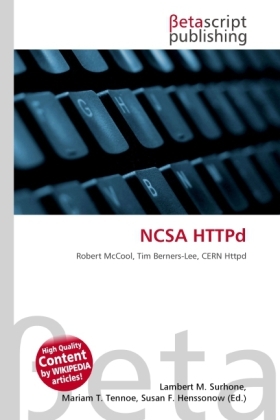 NCSA HTTPd was a web server originally developed at the NCSA by Robert McCool and others. It was among the earliest web servers developed, following Tim Berners-Lee's CERN Tony Sanders' Plexus server, and some others. It was for some time the natural counterpart to the Mosaic web browser in the client-server World Wide Web. It also introduced the Common Gateway Interface, allowing for the creation of dynamic websites. When development slowed down, an independent effort, Apache project, took the codebase and continued; meanwhile, NCSA released one more version (1.5), then ceased development. At the time, NCSA HTTPd powered over 95% of all webservers on the Internet; nearly all of them switched over to Apache.